This is a business fable that is as inspiring as it is curious. The story is about the journey of a job applicant, Moira, who decides to pursue a want ad from a once-mighty company called Zenobia. Each chapter illustrates a basic principle for success. But the story is not just about Moira’s progress towards success, it is also about how her actions inspire others to follow her and how they begin to forge their own ways to success. Teaming a CEO with a poet to collaborate on a business book might sound like an “Alice in Wonderland” proposition. But the result, Zenobia: The Curious Book of Business by Matthew Emmens, CEO of the $14 billion Shire Pharmaceuticals, and award-winning poet and author Beth Kephart, is a business fable that is as inspiring as it is curious. Moira’s quest to find Room 133A brings her into contact with the denizens of Zenobia. Along the way, Moira meets several archetypical characters representing the worst of those who populate the business world. To reach her destination, Moira must not only navigate the confusing structure that represents the company itself, but also contend with such employees as Hedger, a man who avoids giving a straight answer at any cost; Trenchy, a woman so confined to her own tasks that she has no idea what her colleagues are doing; and Stomper, a cynical killjoy who would like nothing more than to see Moira fail. In each of the book’s 13 chapters, the authors detail another step on Moira’s journey. Each step illustrates a basic principle for success, such as “Conceive a Plan; Pursue It,” “Prepare for Ridicule” and “Seek the Unlikely Alliance.” As the book progresses, we see Moira succeed because she refuses to be dragged down by the negative aspects of Zenobia. She forges ahead, relying on her talent, intelligence and courage to identify opportunities and solutions to find Room 133A. 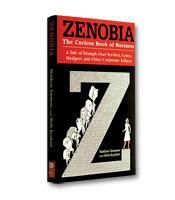 Zenobia is an engrossing read that provides readers with honest enjoyment. The concepts it presents are often astonishing in their simplicity. Logically, we all understand that in order to succeed we must first have a plan and then be prepared to follow it. Most of us can expound on the virtue of being a good listener. However, the authors reveal the importance of these concepts not as declamations from business gurus but rather as lessons from an engaging heroine on a unique journey. Zenobia is a book for anyone who has lost his or her way in the business world, who feels stalled or who just needs a little inspiration. Moira’s story is a reminder of what can be achieved in business and in life when we aren’t afraid to take risks and show some courage.